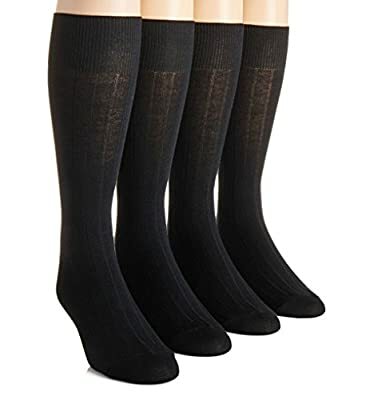 Calvin Klein Men's 4-Pack Solid Ribbed Dress Socks provide all day comfort. Product Features:Crew socks, Ribbed, 4 pair pack, Fits men's shoe size 7-12, 72% polyester, 26% cotton, 2% spandex. 72% polyester, 26% cotton, 2% spandex Country of origin: Imported Care: Machine wash warm and line dry. 2-5/8" ribbed band. 9-1/2" tall hose. 8-3/4" long footbed. Reinforced toe seam.